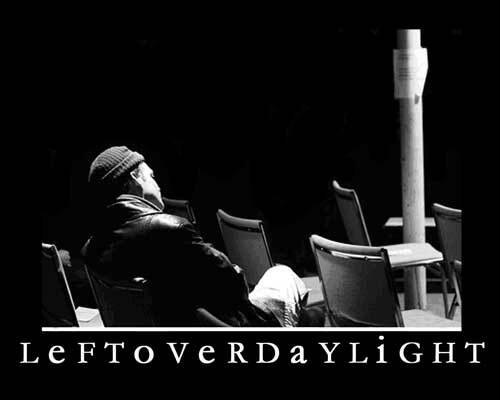 The Leftover Daylight Series was started in November 2003 by Ken Aldcroft and Joe Sorbara. It began as a bi-weekly creative music series presented at the Array Space, then on Atlantic Avenue in Liberty Village. The series soon became a weekly event featuring creative musicians from all over Toronto as well as many of our travelling colleagues from far and wide. Throughout it's ten year history, LoD relied heavily of the donated time and energy so many supportive friends. It has been run by Ken Aldcroft, Colin Anthony, Rob Clutton, Colin Fischer, Nick Fraser, Geordie Haley, Rob Piilonen, Nicole Rampersaud, Heather Saumer, Mark Segger, Joe Sorbara, and Scott Thomson with the help of a long list of guest curators, performers, and friendly experiencers. This site lives as an archive of the series' history. For current creative music happenings in Toronto, please visit the sites listed below. Happy listening.